Why Are There White Specks on a Hibiscus Plant? Colorful variety is one great advantage of growing a garden, but if the white specks on your hibiscus flower or tree were not planned, you may be facing a problem with your plant. There are a number of factors that can cause white specks on hibiscus flowers and trees, and knowing what they are and how to fight them can save your plants, and possibly your whole garden. According to Master Gardener Landscaping in Fort Lauderdale, Florida, hibiscus plants are sometimes called "queen of the shrubs" because of their large variety of uses, colors and styles. More than 30 species of hibiscus are commonly grown in garden centers, nurseries and home gardens throughout the United States. 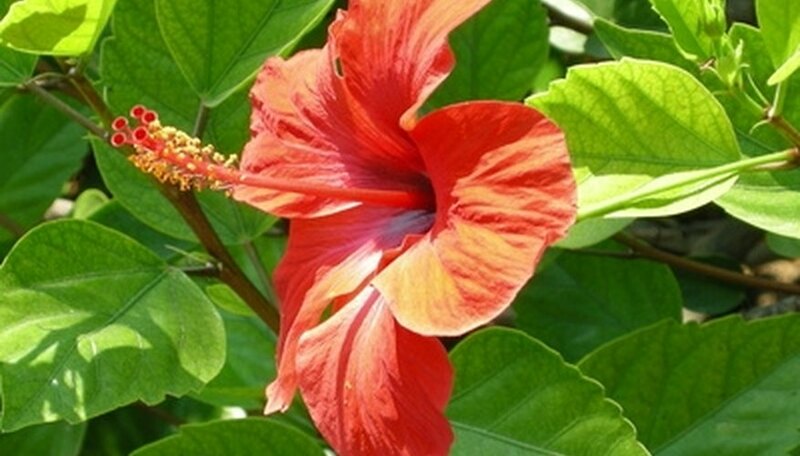 Fancy hibiscus species create captivating colors, and are often shown at professional gardening shows. These species generally grow to be only 2 feet tall. In contrast, larger shrub hibiscus grown outdoors can reach 15 feet. Some also grow as small trees. The white spots on your hibiscus can vary depending on the type of hibiscus you grow. If you are growing shrubs or small plants, white spots on the leaves can be a sign of sun stress on the plant. According to Hidden Valley Hibiscus in Bonsall, California, hibiscus react to sunlight like humans do. Moderate sunlight will help a hibiscus plant grow and thrive, but too much can be dangerous. Like sunburn on human skin, the small white specks are a sign of too much exposure to direct sunlight. Because the specks on shrubs and smaller plants are caused by intense exposure to direct sunlight, treat the problem by reducing sunlight exposure. Move houseplants to an area where they will receive less direct sunlight, or move them out of the sun after two to three hours of direct sunlight. For shrubs or plants outside that are harder to move, consider planting taller trees or shrubs next to your hibiscus; as the sun travels overhead, it will be partially obscured by the taller plants, providing the hibiscus some relief. You could also pitch umbrellas or awnings near the hibiscus after two to three hours of direct sunlight each day to reduce sun exposure. White specks on hibiscus trees often appear on the trunks and branches. Unlike the spots on the flowers or shrubs, these specks are not caused by the plant itself. White specks on a hibiscus tree are an infection caused by an insect known as "pinnaspis strachani," or snow scale. Snow scale is extremely common in the southern and eastern areas of the United States. The bugs attach themselves to tree bark and feed off the tree's nutrients. The hardest part about treating snow scale is that traditional insecticides will not affect them. The creatures live within a thick, protective shell that insecticides cannot penetrate. The best treatment for snow scale is horticultural oil, which is available at most garden centers and nurseries. Apply the oil directly to the white specks or, for larger problems, spray the oil onto the plants. Never apply this in direct sunlight, however, as heated oil can burn the plants. Remember that other oils, such as WD-40, will have the same effect on snow scale, but can potentially harm or stain the tree. If at all possible, use horticultural oil.